Daily Illuminator: It's A Prime Time For Slime Time With GURPS! July 17, 2015: It's A Prime Time For Slime Time With GURPS! GURPS Dungeon Fantasy heroes are used to looking danger in the eye. But what if the threat doesn't have eyes? What if the encounter is more pseudopod-y and poisonous, more slimy and surreptitious? 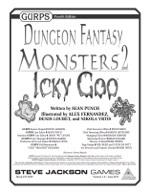 The slick answers can be found within the pages of GURPS Dungeon Fantasy Monsters 2: Icky Goo, the latest supplement for Dungeon Fantasy. Written by GURPS genius Sean Punch, Icky Goo covers the biological realm between "alive" and "a trap." (See what we did there? Covers? Sorry; slime joke.) It includes fungi, jellies, molds, oozes, slimes, and other disgusting denizens! Each entity has a full description, including how it fits into the dungeoneering ecosystem, its abilities and tactics, and a slew of ways to vary each one. (Slew -- monster joke? Sorry again.) Discover the variety of short- and long-range defenses for fungi, the capabilities of different colors of mold, the nasty effects of spore clouds, and much more. And you'll learn other secrets of these biohazardous baddies, including what treasures they might guard, how they can be used as a treasure, and how other monsters use them to their advantage. With Dungeon Fantasy Monsters 2: Icky Goo, your crypt-crawling heroes will never look the same way again at sludgy water, inky ceilings, or "harmless" toadstools again. Download it today, only from Warehouse 23, where (last joke incoming) your squish is our command!